1. Avoid the use of cellphones. While it may not be "illegal" in every state yet, it is still dangerous to drive while on the phone. Cell phones, whether used to talk or text, can take your focus away from the task at hand: arriving to your destination safely. 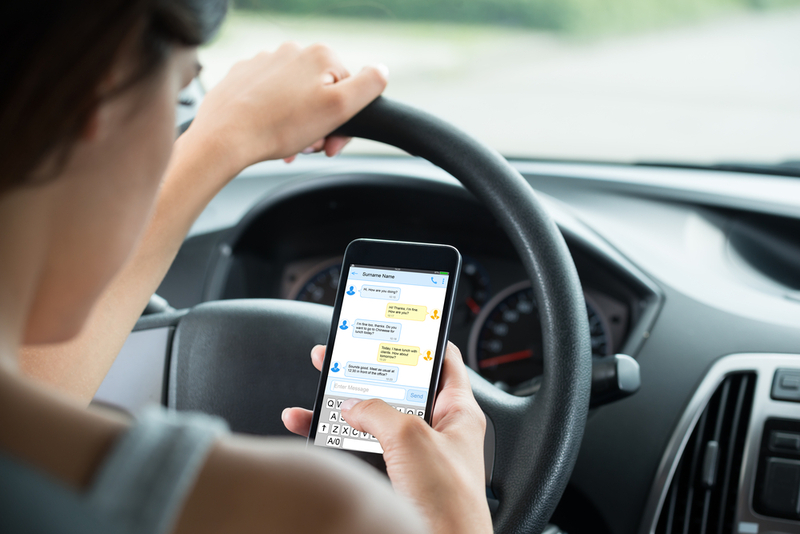 Sending or reading a text message takes your eyes off the road for about 5 seconds, long enough to cover a football field while driving at 55 mph. 2. Don't go over the speed limit. Speeding is not only an easy way to get a traffic ticket, but also a way to get into an accident. For your average drive across town, 10 mph faster is only going to save you a few minutes, while increasing your crash risk by as much as 50% - as your speed increases, so does your braking distance, so slow down! 3. Always use caution when changing lanes. One of the easiest ways to get in an accident is by cutting someone off, changing lanes too quickly or not using your turn signals. Before you pass a vehicle, check your rearview mirrors and look over your shoulder to check your blind spots. Blind spots are the spaces you cannot see with your rearview mirrors. Do not drive in another vehicle's blind spot. And remember the left lane is for passing. If you are not passing, then merge into the right lane to allow other vehicles to safely pass. 4. Don't follow too closely behind other cars. 5. Watch out for others on the road. Just because you are doing everything you're supposed to on the road, doesn't mean that everyone around you is following the same safety precautions. Be prepared for unpredictable lane changes, sudden stops, unsignaled turns, swerving, tailgating and every other bad driving habit you can think of. 6. 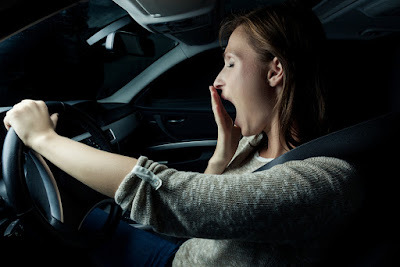 Avoid driving when you are tired. Being tired can make operating a vehicle very dangerous. When you feel tired, it is harder to make decisions and to react to the traffic around you. You may fall asleep at the wheel. When you feel sleepy, pull off the highway at the nearest rest stop or service area. If you are really sleepy, take a nap. Tired drivers are a great danger to themselves, other drivers, and can be as dangerous as intoxicated drivers. 7. Keep your eyes moving at all times. Be aware of your surroundings and of any other vehicles around you, especially on busy highways. Notice what is happening on the sides of the road and check behind you through your mirrors every 6-8 seconds. 8. Turn on your headlights. Using your headlights increases your visibility and helps other drivers see you, even when you feel like it's still light out. A car is visible for nearly 4 times the distance with its headlights on. Be sure to always use them at night and during inclement weather! 9. Come to a complete stop at stop signs. Stop completely at stop signs. Don't do rolling stops. A good rule of thumb is to count to four before proceeding. Also, be sure to always turn your head left, then right, straight ahead and then left again before proceeding through an intersection. Do the same when a stoplight turns green to ensure someone else is not going to run the red light. 10. Make sure your vehicle is in prime condition. Before hitting the road, make sure your tires are properly inflated, all fluids are at their proper levels and you have a full tank of gas. If you're going on a long road trip, you might want to have a mechanic look it over before heading out. 11. Never drink and drive. 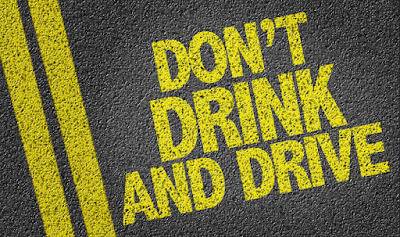 While this is pretty much a no brainer, don't drink alcohol before getting in a car. Driving while intoxicated is illegal, plus alcohol can impair your senses, including your reaction time. Even if you're not drunk, even a small amount of alcohol can make you sleepy or impair your decision making abilities. While not all auto accidents are avoidable, following these safe driving tips will definitely decrease your risk! 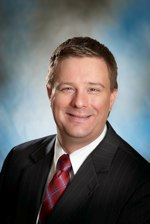 One of the most important aspects of safe driving is making sure your Lake of the Ozarks auto insurance is up-to-date. Contact Insure the Lake today at 573-348-2794 to see how we can help you with all your insurance needs! Thanks for the post. The blog is having the valuable details. Windscreen Crack Repair is the place where you can replace your broken glass of your car. Get Ready for 2017 Lake of the Ozarks Shootout!